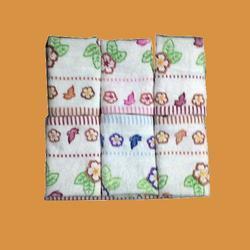 very soft 100% towel hanky with emb in latest designs is a evergreen item. very reasonably priced and a hot selling item. 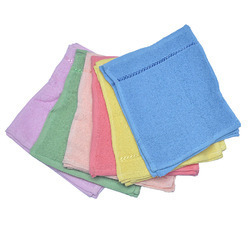 We are leading exporter of Towel Handkerchief mainly for European Countries like Russia, Germany, France , UK , Italy , Spain etc. 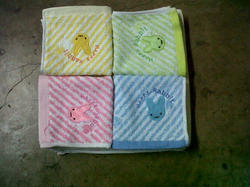 100% cotton, face towels / hankies. Fast colors. Bulk supplies solicited. 22/22 CMS. Four sides peeco stitching. 100% cotton. Six colors available. Colors : 6 as attached. Rates are net ex godown Delhi. Shipping charges and GST extra. Used for catering and disposable napkins. Famous to use for marriage parties in kashmir. 8/8 inches. Soft white towel napkins . Rates are ex godown Delhi. Taxes extra. 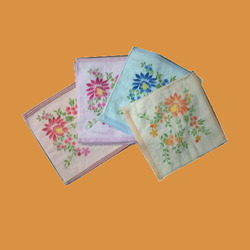 100% cotton Fancy Embriodered hankies. Packaging Details: Good Export Quality Cartons. Individual Packaging - Polythene Master Packing Cartons As Per Customer Demand Packaging Charges Bear to Customer. 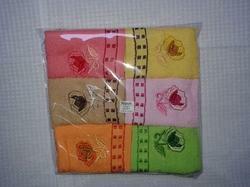 We are engaged in offering a comprehensive range of Towel Hankey. Our products find extensive usage in washing purposes and hand cleaning. 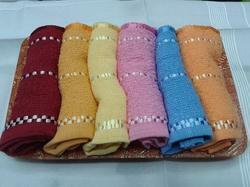 We manufacture using the finest quality of cloth materials and offer in different colors and styles. Moreover, the range is immensely valued. 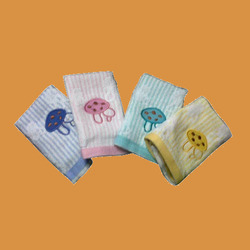 We offer a diverge collections of Designer Towel Handkerchief for ladies and gents which is offered at economical price. 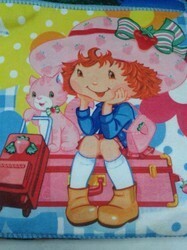 Our expert manufactures this towel in various designs, styles and vibrant colors. 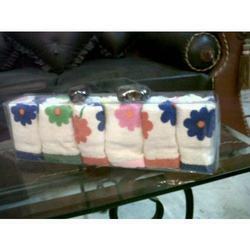 As per clients' specification, we also provide customized hand towels. This range finds useful in assuring the cleanliness and comfort to the hands. 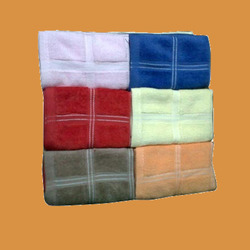 Our towels are appreciated for the durability, and skin friendly features. We are into business of fancy affordable hankies for ladies with floral prints, dark prints, and lace/patch work. 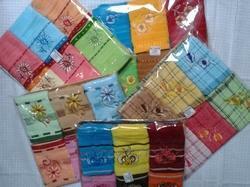 Six pcs Ladies hanky sets made up of 100% cotton, fine quality yarn printed with fast colors and latest designs.